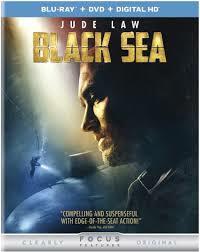 Black Sea is a solid submarine thriller—not as good as Das Boot or Below or but a whole lot better than U-571 or the Steven Seagal stinker Submerged—that offers the usual go-to assortment of submarine movie thrills, as well as a few fresh ones. In the movie, newly out-of-work deep sea worker Robinson ( a gruffer-than-usual Jude Law of Contagion) is hired to salvage millions in gold bullion that are said to be aboard a sunken Nazi submarine somewhere in the Black Sea. 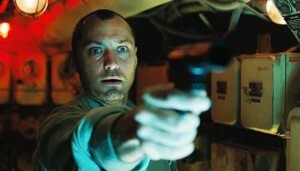 Diving in a beat-up sub manned by a crew of Brits and Russians who speak different languages, the salvage mission encounters one problem after another, both physical (a cranky engine, a leaky hull, cramped quarters and so on) and psychological (claustrophobia, paranoia, superstition). Of course, the crew’s realization that if less men live through the ordeal, more gold will go to survivors begins to trump all the other problems…. Director Kevin Macdonald (Marley) and his team capably set up a number of tense moments and combustible set pieces. And though Dennis Kelly’s script is a bit far-fetched at times, it still contains a couple of effective twists, while its working class characters maintain a nasty regard for the rich landlubbers who snatched their jobs and thrust them into their predicament. Put this one on at night in a darkened room for maximum immersive enjoyment.